Two Guernsey buildings have achieved success in a national awards scheme. The Garenne Stand at Footes Lane and the Generali Building in St Peter Port have both won Civic Trust Awards. The scheme recognises projects which make an exceptional contribution to the environment they are in an promote the best in new architecture. 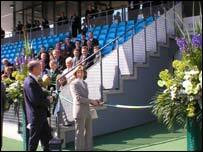 The Garenne Stand was commended for its simple yet careful design and for being an excellent venue for both viewing and taking part in sport. The judges described Generali House as "making a bold statement" and helping to liven up the surrounding area. The teams behind the projects will receive certificates and plaques to display. Vivienne Newlands, Civic Trust Awards manager, said: "Civic Trust Awards are awarded to projects of the highest quality design, but only if they are also judged to have made a positive contribution to the local environment - and helped improve the places where we live."